On a diplomatic mission to the elusive non-Federation planet Gideon, Captain Kirk finds himself alone on an abandoned Starship Enterprise. What is happening, who is the mysterious woman that he finds roaming the empty halls of the ship, and can they uncover the mystery before it's too late? Matthew: This is another of the "allegory" episodes of Star Trek, and I think it is a fairly successful one. We can see that futurists and writers were concerned with Malthusian problems of population (as evidenced by the 1967 book "Logan's Run", the film of the same name, and the later "Soylent Green " from 1973). We are given a story that lends itself well to creepy scenes and feelings, as well as some surprisingly progressive sexual political messages. When Kirk finally confronts the Gideons about their population problem, he essentially says "Why don't you just use contraception? We have foolproof technology for it in the Federation." The Gideons respond that their society has a "reverence for life," one which has doomed them to a choking, over-populated misery. Kevin: It's odd now, somehow, to remember that back when the world's population was 3 billion, people were freaking out about overpopulation, given that now, we're pushing 7. This one lacked the too-obvious imagery of "Let That Be Your Last Battlefield" or the sermonizing of say DS9's "Past Tense." I didn't remember this episode too well, and I was genuinely blown away when Kirk casually mentions birth control. It was only two years prior to this that the Supreme Court said a state could not limit access to birth control to married couples, and it wouldn't be until 1972 that they did the same for unmarried people, so this was a much more of a button issue then than it is today. I will say I find the Gideon position a little tortured for the sake of the plot. How does "reverence for life" extend to intentionally infecting people with a painful illness? How far would they take it? Would they refuse medical treatment to those who had a change of heart about dying? Is this really a more pro-life position that handing out condoms? Matthew: This concept turned out to be a clever "bottle show" that no doubt saved the producers lots of money, but still worked as an entertaining sci-fi drama. 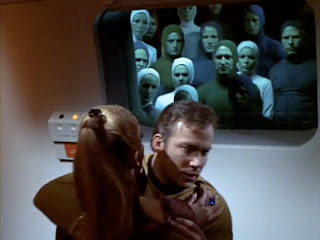 This is not to say that the episode is only Kirk wandering the halls of the ship, either. The bridge crew gets a few juicy scenes, trying to negotiate with the Gideons for permission to search for Kirk. The theme of the Federation as a bureaucracy run amok is revisited, as Starfleet will not back Spock on a rescue mission. Kevin: Spock's line about diplomats existing to extend crisis was perfectly written and delivered. The empty Enterprise was quite haunting, and Kirk's sense of dread and loss was pretty affecting. Matthew: There are some inherent suspensions of disbelief necessary to enjoying this story. How could the Gideons have built such an exact replica of the Enterprise, one detailed enough to fool its own captain? The Gideons' plot to capture Kirk seems to have some needlessly convoluted reasoning, as well. I didn't find these to be crippling defects, though. The atmosphere carried the day. In an interesting departure, there is no captain's log - instead, we get an oddly effective "voice over," which gives us a look into Kirk's thoughts upon discovering himself alone. Kevin: The best I could come up with was the idea that on a replica Enterprise, he would be controllable, but not think himself a prisoner. If he finds himself alone with the attractive woman, and thinks his crew is gone and he is stranded, he might turn to her. The classic "trapped on a desert island" scenario. If he were just held more obviously by the Gideons, he would resist even his own galactic libido just to make a point. Matthew: Odd notes include Kirk's shift from concerned officer to seducer - it sort of just happens, rather quickly, Kirk goes from serious to "hey baby..." This did precipitate some funny dialogue - Odona asks Kirk: "Can you make it last a long time?" After which, it is pretty clear that they knocked boots, as they are seen leaving Kirk's quarters together at the beginning of the next act. 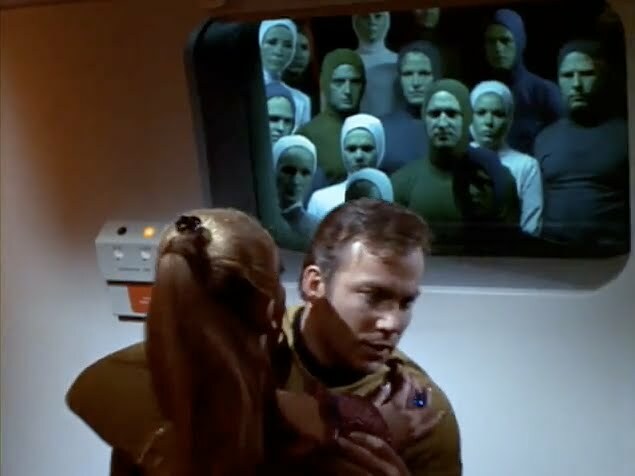 I also found it pretty creepy that Odona's dad (the leader of the planet, naturally) was watching his daughter cavort around with Kirk on the viewer, wirth the rest of his council present, no less. Was there a camera in the bedroom, too? Kevin: I was most bothered by the final exchange between Odona and Kirk. She's off to go be Typhoid Mary, and Kirk seems pretty sanguine about the massive death that will ensue, and it just felt off, as a final scene. Not as bad as the laugh-out in "The Ultimate Computer," but still the wrong emotional tenor to end this otherwise great episode on. Matthew: I found Nimoy particularly good, as Spock jousts with the Gideons in the thinly veiled language of diplomacy. Shatner was pretty standard for me in this one. Doohan gets a funny scene as the Gideons accuse the Enterprise of having faulty transporters. It's always fun to see Mr. Scott get his dander up over "his bairns" or some other piece of ship's equipment. Kevin: Like I said before, Spock's back and forth with the Gideons was fantastic. Kirk was adequate, and I mean that in a non-derogatroy, Seven of Nine emotionless appraisal of the situation way. Matthew: David Hurst as Hodin was pretty good. His line readings were smarmy and supercilious, just like an ambassador ought to be. Sharon Acker as Odona was kind of ... meh. I'm not going to lay it all on the actress, though. The plot kind of required the character to act a bit dumb for the first half hour or so. Kevin: I enjoyed her walking through the corridors with her arms spread. Even in her duplicity, she would have been genuinely awed by the empty space, and the physical movements were a nice touch. I don't know if was the actress or the director, but I liked it all the same. Matthew: Production-wise, this is a bottle show to the extreme. We do get several interesting camera angles on the Enterprise, though, and it's nice to see the ship without extras in the way of interesting sets and props. One of the creepiest scenes plays out through the rarely-seen viewing port, and I loved it. The port was well done, with a realistic control for Kirk to use. Kevin: The viewport scene was downright creepy. It was less effective on the bridge where it seemed like they were floating in space. But seriously, I kept expecting to see Vincent Price in the crowd staring malevolently. The lighting was particularly effective. The green pallor over the Gideons may be a bit much, but it helped the mood. And the Enterprise was lit really well too. It was more than just dark and shadowy. The ship looked no one lived there, and a great thing the production teams has always done in both number of people aboard, and places like rec rooms and arboretums is make the ship look like a place where people live and work. 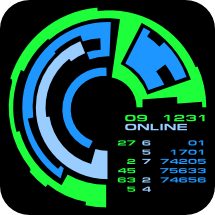 Matthew: What we saw of the Gideon homeworld was sparse, a pretty basic set with a hexagonal theme. Their costumes also fit this theme - though why does this council get to rock the hexagons, whilst the rest of the teeming hordes all wear hooded onesies? It's too bad that we couldn't have seen more of the planet - naturally, the budget for extras likely precluded this. But maybe some stock footage could have worked. Kevin: Of all the headgear we have seen the natives sport, this is by far the least offensive. I really liked the scene of people outside the council chambers. It made sense they would stand still around the Enteprise mock-up as they were watching, but the constant bustle of activity outside the council chamber gave a touch of realism to Gideon. Matthew: This is a pretty easy 4 in my book. Any faults in the concept, the acting, or the production are more than made up for by the overall feel of the show. It's an interesting exploration of the topic, a good, strong sci-fi story, and very much in keeping with the Trek ethos. I enjoyed this viewing and I always look forward to it when it comes up in the Trek queue. Kevin: Like I said, I didn't remember this episode particularly well from the last time I saw as a child, so it was almost like watching a whole new episode, and I have to agree with Matt, it's a damned good one. Some of Star Trek's best episodes come out of bottle shows where they really have to work a plot to make an episode sing, and this is a prime example. I'm giving it a 4 and that makes a total of 8. This is when I start to hate watching these episodes on syndicated TV, because I've seen Day of the Dove 3 times but I still haven't seen this one. And now I really want to! I'm on board with the idea of a society feeling death and disease is morally preferable to contraception, since that's the official medieval Catholic church doctrine, and there are plenty of Christians who still believe that vaccines are a sin because you're opposing God's will by preventing disease. If you're a good Christian, (the philosophy goes) you trust God not to give you a deadly disease, and then if He does anyway you trust that it was part of His plan. It's harsh, and there are lots of problems with it, and I like the sound of an episode that explores what happens when a society reaches the modern age without being able to shed or outgrow its old ideas. Is MeTV not doing them in order? I thought they were, since TNG is being shown in order. Anyway, both Kevin and I have these on DVD, so if you ever want to borrow the whole series, I'm sure you can. What you describe are the intellectual strengths of this story. I love how matter of fact Kirk is when hearing about Gideon's population problem. He all but says: "Umm, why don't you idiots use birth control?" "I'm on board with the idea of a society feeling death and disease is morally preferable to contraception, since that's the official medieval Catholic church doctrine,..."
Genuinely curious; how is that not still essentially contemporary Catholic church doctrine? The official position, in a nutshell, is 'AIDs exists, don't use condoms.' There aren't any loopholes. And, since you brought up the church, this episode is quite equivalent to the Catholic church, if its strict orthodoxy ruled the Earth since human beings arrived and--throwing in the Gideonlike afffect of no disease and minimal aging--our population was now in the neighborhood of 100 billion people, introducing typhus or cholera or ebola in order to make the planet tolerable again. The Mark of Gideon isn't an allegory, then, so much as it is the logical extension of certain currently held beliefs, with the added soupcon of extreme longevity.